LEDGlow’s LiteTrike® III Advanced Million Color LED Lighting Kit is a complete kit that includes 20 strips and is specifically designed for your trike or Can-Am. This trike led lighting kit offers 15 solid color options giving your trike a unique look. LEDGlow’s LiteTrike® III Advanced Million Color LED Lighting Kit is a complete kit that includes 20 strips and is specifically designed for your trike or Can-Am. This trike led lighting kit offers 15 solid color options giving your bike a head turning look, as well as adding much needed visibility for when you are riding at night. Our trike motorcycle LED lighting kit includes (6) 3", (4) 7", (2) 9", (2) 11", (2) 18", and (2) 24" strips, as well as (2) 36" wheel well strips, totaling 330 SMD LEDs. The included led motorcycle light strips lengths were designed specifically for trikes, but can be cut after every third LED, giving you even more options when it comes to installing each strip. However, the 36" wheel well strips cannot be cut to fit. If you do need to cut a strip, we have included 2 end caps that will allow you to seal the end of the strip so they do not get damaged by water or while riding. 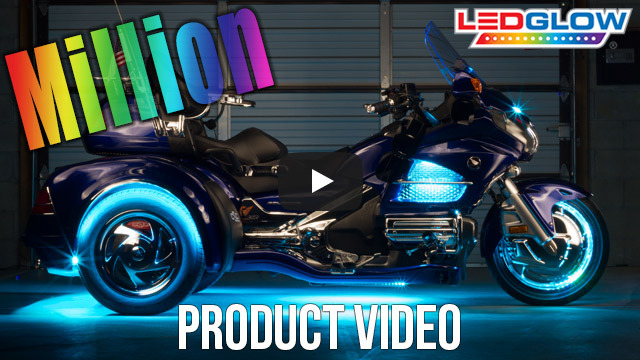 LEDGlow’s LiteTrike® III Million Color LED lighting kit features surfaced mounted RGB LEDs that will give you ultra-vibrant solid color modes and also allow for a lower profile lighting strip that can be easily hidden. SMD LEDs are comprised of three individual LEDs which are used to make each 15 distinct solid colors, and when looking directly at the strips you cannot see the three separate LEDs. The included control box features 15 dynamic solid color modes, 2 color cycle modes, 3 flashing modes, and 1 fading mode all of which are easily selected with either one of the two included wireless remotes. Each flexible trike led lighting strip features 4' of power wire, and with the included 3M tape you can bend and curve each strip to your desired mounting location. LEDGlow’s trike LED lights include a one year limited warranty and free lifetime technical support.